The Habersham County Extension Office provides residents of Habersham County with a diverse array of information, educational programming, and testing services. Extension is a unique partnership between the Habersham County Board of Commissioners, the Habersham County Board of Education, the Habersham United Way, and the University of Georgia College of Agriculture and Environmental Sciences Cooperative Extension System. Congress established the Cooperative Extension Service in 1914 to deliver information from land-grant colleges and universities to all Americans, particularly those who lacked access to formal education. Although agriculture and society have changed dramatically during the past 90 years, the University of Georgia Cooperative Extension continues to fulfill its basic mission. Whether you would like to increase your crop yield, grow healthier roses, make your lawn greener, test the quality of your drinking water or make sure your creek isn't polluted, the Habersham County Extension Service can help. The Extension Service's Agricultural and Environmental Services Laboratories (AESL) provide objective analytical services to agricultural producers, consumers, and agribusinesses. These services, combined with unbiased interpretations and recommendations, contribute to a competitive agriculture, a healthy environment, and an improved quality of life. Whether you’re interested in a routine/basic test or a specific test to solve a complex problem, the Extension Service is available to help. Sample fees and sampling procedures vary based on the testing desired. Contact the Extension Office for information and details on proper sample submission. Habersham Extension is located in the Agricultural Services Center Building behind the old county courthouse in Clarkesville. Through County Extension offices, the University of Georgia College of Agricultural and Environmental Sciences helps Georgians become healthier, more productive, financially independent, and environmentally responsible. Learning for Every Day through the cooperative funding of federal, state and county governments, Extension Agents are in almost every county in Georgia. Most counties have a combination of agents who specialize in agriculture and natural resources, youth development and family and consumer sciences. Agents complete specialized training to help them meet the needs of the communities they serve. Some specialize in horticulture; others, in row crop or livestock production. Some agents work to help families deal with rural development issues or raise healthy children in urban settings. If you'd like to learn about building a safer environment for your children or protecting the environment we all share, avoiding chronic diseases like diabetes with healthy food or training food handlers in your cafeteria, the University of Georgia Cooperative Extension is the place to start. 4-H is a world in which youth and adults learn, grow, and work together as catalysts for positive change! 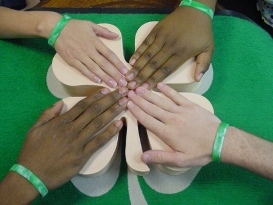 The mission of Georgia 4-H is to assist youth in acquiring knowledge, developing life skills, and forming attitudes that will enable them to become self-directing, productive and contributing members of society. This mission is accomplished through "hands on" learning experiences focused on agricultural and environmental issues, agriculture awareness, leadership, communication skills, foods and nutrition, health, energy conservation, and citizenship.